The human heart was considered a 'surgical untouchable' for most part of scientific history. The science and art of cardiac surgery has made rapid strides in the past 65 years. The surgery for transposition of great arteries (TGA) symbolises the manner in which cardiac surgery has progressed. 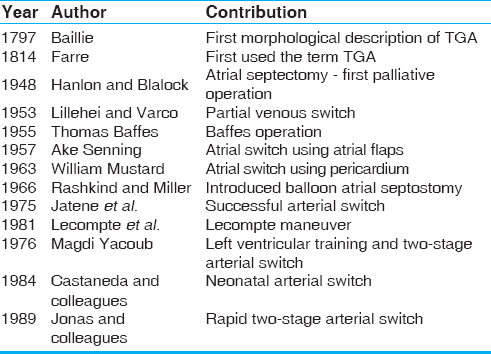 The eventually successful solution in the form of the now popular arterial switch operation (ASO) was elucidated after multiple contributions from several surgical stalwarts and geniuses over more than 25 years [Table 1]. This review traces the various milestones along this journey. 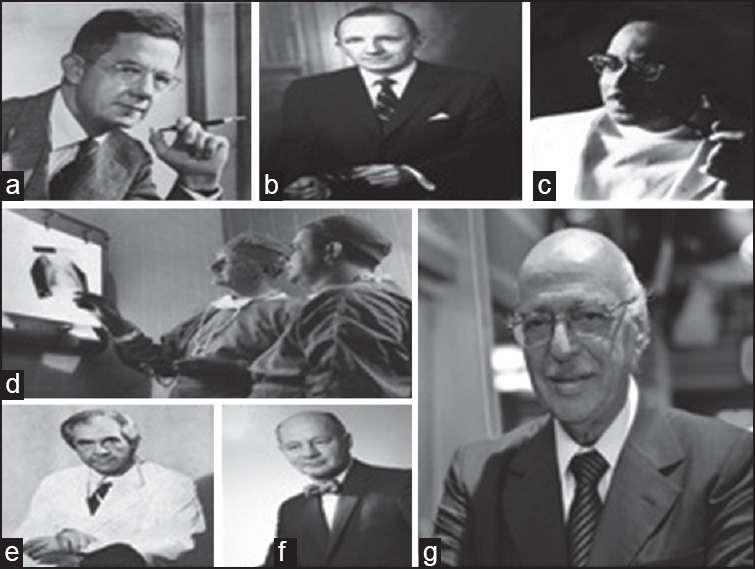 The first credit of surgical treatment of TGA goes to Alfred Blalock [Figure 1]a and his then resident, Rollins Hanlon [Figure 1]b from Johns Hopkins. In 1948, in a joint paper, they described the essence of successful surgical "treatment" of TGA, allowing effective mixing of both the parallel circulations. Analyzing 123 cases of TGA from different sources, they concluded that the presence of a ventricular septal defect was favorable for survival, followed by the presence of an atrial septal defect. A combination of the two defects was the most favorable situation. Armed with this information they realized that, surgical creation of a mixing site would improve the longevity of these patients. As the heart lung machine was yet to be brought into clinical use, a closed heart procedure was the only possible answer. In the same article, they further described their canine experiments involving the redirection of pulmonary venous blood to the right atrial appendage or superior vena cava using special occlusive clamps through thoracotomy. It was found that redirection of the pulmonary venous blood to the SVC was better in terms of patency and had the potential to be evaluated further as a possible treatment modality for TGA. 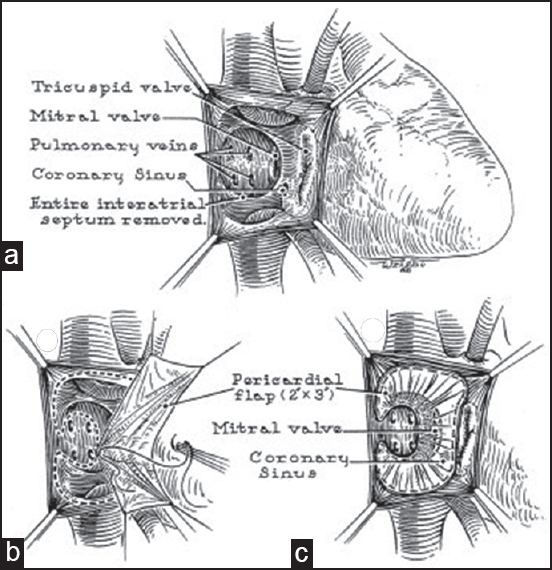 In 1950, they first reported the use of a surgically created atrial septal defect as a treatment of TGA called the 'Blalock-Hanlon Septectomy' [Figure 2]. Interestingly, like the Blalock-Taussig shunt (BTS), Blalock's assistant Vivien Thomas [Figure 1]c had conceived the idea and flawlessly executed it in animal models in the late 1940s. In spite of being a palliative procedure, this surgery laid the foundation of the surgical treatment of TGA and has been aptly described as an 'act of surgical genius'. With the advent of 'balloon atrial septostomy (BAS), the Blalock-Hanlon septectomy eventually became redundant. The idea of attempting to correct TGA at the atrial level using a baffle can be attributed to Dr. Harold M Albert and is frequently referred to as the 'Albert principle' [Figure 4]. He suggested the use of 'plastic prosthesis' for the baffle, but used pericardium for his canine experiments. Albert did not attempt this operation clinically. But this idea formed the basis of the atrial switch operation; specifically the Mustard procedure. Albert's mentor and guide was none other than Dr Willis Potts. The Senning operation was perceived as "although ingenious, technically extremely difficult in the infant or small child". It was practically abandoned and for the next decade, the Mustard procedure was used universally by surgeons including Dr Senning himself. However by 1975, the Mustard procedure revealed its shortcomings including baffle obstruction and lack of growth potential. This led to a resurgence of the Senning procedure and it remained a favorite for the next decade. Though the arterial switch was successfully added to the surgical armamentarium in 1975, multiple but seemingly unsuccessful attempts were already made by Mustard et al., in 1952 using monkey lung as an oxygenator,  Bailey et al., in 1952,  and also Senning in 1955. The major difficulty perceived was the coronary transfer. It was soon realized that a technically perfect coronary artery transfer was the most critical step in a successful ASO. As Jatene quotes "to divide, contrapose and then re-anastomose the great arteries is not a surgical problem. The major technical difficulty in this approach has been the transfer of coronary arteries"  Hence, a detailed understanding of the possible variations in the origin and course of coronaries and its surgical management was an essential step towards it. The most widely accepted system of classifying coronary anatomy in TGA is called the Leiden convention. It was initially proposed by Gittenberger-DeGroot et al., working with Quaegebeur's group based in Leiden, Netherlands. 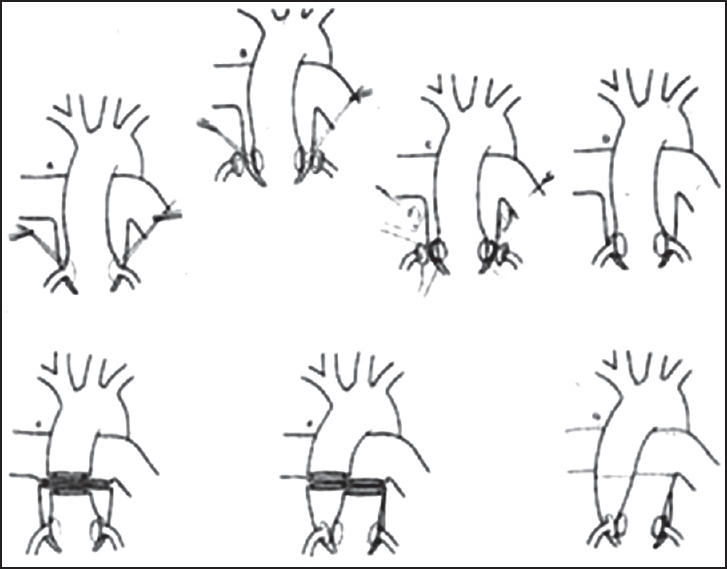 In this system, the aortic sinuses are numbered based on the perspective of an imaginary person looking from the aorta to the PA. This has further simplified the understanding and conduct of the ASO. In 1984, Castaneda and colleagues from the Children's Hospital, Boston introduced the concept of the neonatal arterial switch describing their experience with 14 neonates. This emphasized the ability of the neonatal LV to successfully handle the systemic circulation. Today neonatal arterial switch remains the treatment of choice for TGA with remarkably low mortality. The concept of rapid two-stage arterial switch for patients with TGA with intact septum presenting beyond neonatal period was introduced by Jonas and colleagues in 1989. The concept was based on studies on molecular biology of cardiac hypertrophy of the then Chief of Cardiology of Boston Childrens' Hospital; Dr Bernardo Nadal-Ginard. His work demonstrated that, in response to pressure load, there was a shift in the isoforms of heavy chain myosin and the changes were maximum at 48 h from the onset of pressure load. In a rapid two-stage procedure, the first stage consists of pulmonary banding to provide the after-load with a modified BTS to provide a preload and improve the systemic oxygen saturation. This is followed by a corrective second stage arterial switch 5-7 days later. Apart from the Fontan palliation, very few surgical treatments have undergone such rapid evolution through various stages as that of TGA. History stands witness to a combination of brilliant innovation, technical ingenuity, and surgical expertise of multiple surgeons to whom this article is dedicated to. This overview shows that surgical techniques need continuous reappraisal and refinement. The quest to perform a perfect arterial switch remains a perpetual effort. The journey may have only just begun. Baillie M. The morbid anatomy of some of the more important parts of the human body. 2 nd ed. London: Johnson and Nicol; 1797. p. 38. Farre JR. Pathological researches. Essay 1: On malformations of the human heart. London: Longman, Hurst, Rees, Orme and Brown; 1814. p. 28. Hanlon CR, Blalock A. complete transposition of the aorta and the pulmonary artery: Experimental observations on venous shunts as corrective procedures. Ann Surg 1948;127:385-97. Blalock A, Hanlon CR. 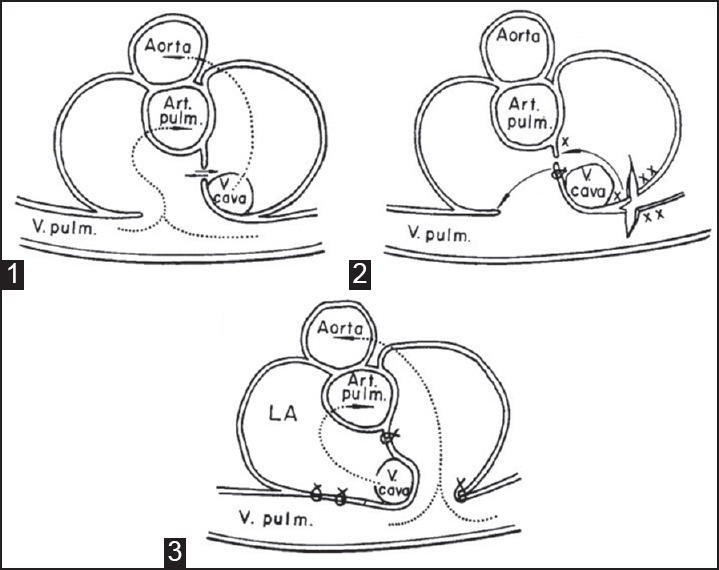 The surgical treatment of complete transposition of the aorta and the pulmonary artery. Surg Gynecol Obstet 1950;90:1-15. Weldon CS. The Blalock-Hanlon operation. Ann Thorac Surg 1987;43:448-9. Rashkind WJ, Miller WW. Creation of an atrial septal defect without thoracotomy. A palliative approach to complete transposition of the great arteries. JAMA 1966;196:991-2. Park SC, Zuberbuhler JR, Neches WH, Lenox CC, Zoltun RA. A new atrial septostomy technique. Cathet Cardiovasc Diagn 1975;1:195-201. Edwards WS, Bargeron LM Jr, Lyons C. Reposition of right pulmonary veins in transposition of great vessels. JAMA 1964;188:522-3. Lillehei CW, Varco RL. Certain physiological, pathological and surgical features of complete transposition of the great vessels. Surgery 1953;34:376-400. Baffes TG. Willis J. Potts: His contributions to cardiovascular surgery. Ann Thorac Surg 1987;44:92-6. Baffes TG. A new method for surgical correction of transposition of the aorta and pulmonary artery. Surg Gynecol Obstet 1956;102:227-33. Baffes TG, Lev M, Paul MH, Miller RA, Riker WL, De Boer A, et al. Surgical correction of the transposition of the great vessels: A five-year survey. J Thorac Cardiovasc Surg 1960;40:298-309. Konstantinov IE, Alexi-Meskishvili VV, Williams WG, Freedom RM, Van Praagh R. Atrial switch operation: Past, present, and future. Ann Thorac Surg 2004;77:2250-8. Albert HM. Surgical correction of transposition of the great vessels. Surg Forum 1955;5:74-7. Creech O Jr, Mahaffey DE, Sayegh SF, Sailors EL. 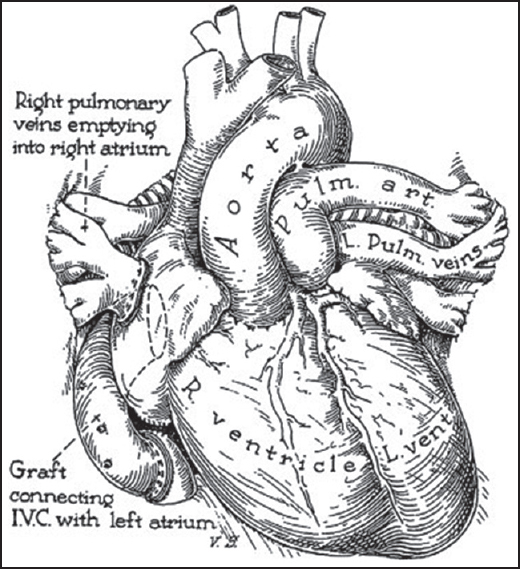 Complete transposition of great vessels; A technique for intracardiac correction. Surgery 1958;43:349-54. Meredino KA, Jesseph JE, Herron PW, Thomas GI, Vetto RR. Interatrial venous transposition; A one-stage intracardiac operation for the conversion of complete transposition of the aorta and pulmonary artery to corrected transposition: Theory and clinical experience. Surgery 1957;42:898-909. Senning A. Surgical correction of transposition of the great vessels. Surgery 1959;45:966-80. Kirklin JW, Devloo RA, Weidman WH. 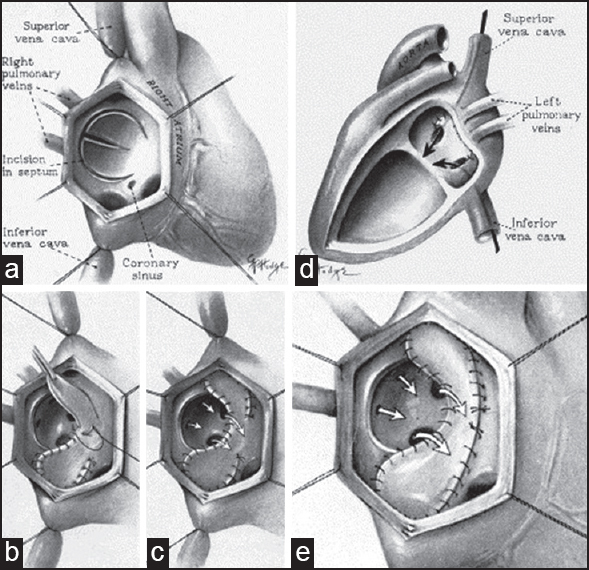 Open intracardiac repair of transposition of the great vessels: 11 cases. Surgery 1961;50:58-66. 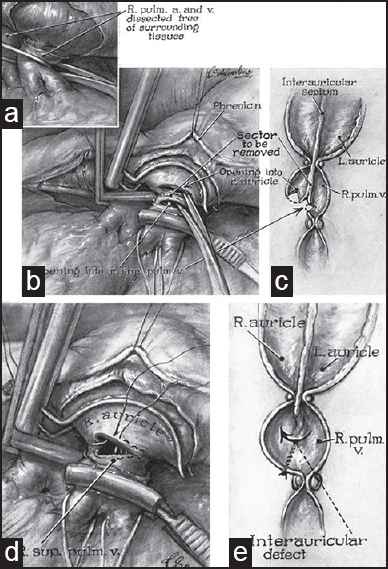 Mustard WT, Keith JD, Trusler GA, Fowler R, Kidd L. The surgical management of transposition of the great vessels. J Thorac Cadiovasc Surg 1964;48:953-8. Quaegebeur JM, Rohmer J, Brom AG. Revival of the Senning operation in the treatment of transposition of the great arteries. Preliminary report on recent experience. Thorax 1977;32:517-24. Mustard WT, Chute AL, Keith JD, Sirek A, Rowe RD, Vlad P. The surgical approach to transposition of the great vessels with extracorporeal circuit. Surgery 1954; 36:39-51. Bailey CP, Cookson BA, Downing DF, Neptune WB. Cardiac surgery under hypothermia. J Thorac Surg 1954;27:73-91. Jatene AD, Fontes VF, Paulista PP, Souza LC, Neger F, Galantier M et al. Anatomic correction of transposition of the great vessels. J Thorac Cardiovasc Surg 1976;72: 364-70. Yacoub MH, Radley-Smith R. Anatomy of the coronary arteries in transposition of the great arteries and methods for their transfer in anatomical correction. Thorax 1978;33:418-24. Gittenberger-de Groot AC, Sauer U, Oppenheimer-Dekker A, Quaegebeur J. Coronary arterial anatomy in transposition of the great arteries: A morphologic study. Pediatr Cardiol 1983;4:15. Lecompte Y, Zannini L, Hazan E, Jarreau MM, Bex JP, Tu TV, et al. Anatomic correction of transposition of the great arteries. J Thorac Cardiovasc Surg 1981; 82:629-31. Castaneda AR, Norwood WI, Jonas RA, Colan SD, Sanders SP, Lang P. Transposition of the great arteries and intact ventricular septum: Anatomical repair in the neonate. Ann Thorac Surg 1984;38:438-43. Yacoub MH, Radley-Smith R, Maclaurin R. Two-stage operation for anatomical correction of transposition of the great arteries with intact interventricular septum. Lancet 1977;1:1275-8. Jonas RA, Giglia TM, Sanders SP, Wernovsky G, Nadal-Ginard B, Mayer JE Jr, et al. Rapid, two-stage arterial switch for transposition of the great arteries and intact ventricular septum beyond the neonatal period. Circulation 1989;80:I203-8. Izumo S, Nadal-Ginard B, Mahdavi V. Protooncogene induction and reprogramming of cardiac gene expression produced by pressure overload. Proc Natl Acad Sci U S A 1988;85:339-43. Mee RB, Harada Y. Retraining of the left ventricle with a left ventricular assist device (Bio-Medicus) after the arterial switch operation. J Thorac Cardiovasc Surg 1991;101:171-3. Kang N, de Leval MR, Elliott M, Tsang V, Kocyildirim E, Sehic I, et al. Extending the boundaries of the primary arterial switch operation in patients with transposition of the great arteries and intact ventricular septum. Circulation 2004;110:II123-7. Bisoi AK, Sharma P, Chauhan S, Reddy SM, Das S, Saxena A, et al. Primary arterial switch operation in children presenting late with d-transposition of great arteries and intact ventricular septum. When is it too late for a primary arterial switch operation? Eur J Cardiothorac Surg 2010;38:707-13. Sharma R. Pulmonary artery banding: Rationale and possible indications in the current era. Ann Pediatr Cardiol 2012;5:40-3. Rastelli GC, McGoon DC, Wallace RB. Anatomic correction of transposition of the great arteries with ventricular septal defect and subpulmonary stenosis. J Thorac Cardiovasc Surg 1969;58:545-52. Lecompte Y, Neveux JY, Leca F, Zannini L, Tu TV, Duboys Y, et al. Reconstruction of the pulmonary outflow tract without prosthetic conduit. J Thorac Cardiovasc Surg 1982;84:727-33. Nikaidoh H. Aortic translocation and biventricular outflow tract reconstruction. A new surgical repair for transposition of the great arteries associated with ventricular septal defect and pulmonary stenosis. J Thorac Cardiovasc Surg 1984;88:365-72.
da Silva JP, Baumgratz JF, da Fonseca L. Pulmonary root translocation in transposition of great arteries repair. Ann Thorac Surg 2000;69:643-5. Schwartz ML, Gauvreau K, del Nido P, Mayer JE, Colan SD. Long-term predictors of aortic root dilation and aortic regurgitation after arterial switch operation. Circulation 2004;110:II128-32. Bonhoeffer P, Bonnet D, Piéchaud JF, Stümper O, Aggoun Y, Villain E, et al. Coronary artery obstruction after the arterial switch operation for transposition of the great arteries in newborns. J Am Coll Cardiol 1997;29:202-6. Pedra SR, Pedra CA, Abizaid AA, Braga SL, Staico R, Arrieta R, et al. Intracoronary ultrasound assessment late after the arterial switch operation for transposition of the great arteries. J Am Coll Cardiol 2005;45:2061-8.